After the successful sale of the smallest town in the U.S. to a Vietnamese early this year, a Tuscan Italian town is now for auction in E-bay with bids starting at no less than €2.5 million (just over $3 million). Years of being unable to sell through real estate agencies, the seller has opted to tap the power and extensive reach of the internet and E-bay to finally sell the property which has been a medieval village with a 12th century tower. According to Carlo Magni, the undisclosed monastic order owns the pieces of property comprising the town of Pratariccia, perched on Casentino Valley is 40km (25 miles) from Florence, Italy. Mr. Magni told the Guardian UK that the price is still negotiable because there are some refurbishments needed to be done including electricity connections. He said that included in the sale are 25 traditional stone homes and 8 acres of pasture lands. He notes that is an idyllic setting for Italian retirement villages or tourist inns as the village sits on a Tuscan hilltop hamlet. The available agricultural land also shows potential for additional income. The asking price of this Tuscan village called Pratariccia has been slashed from €5 million ($6.2 million). 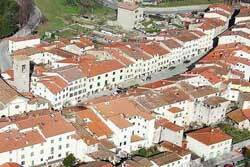 The nearby villages are Bibbiena and Poppi, the latter of which is famous for its 12th century castle. It also borders the Casentino Forests National Park, known as one of the oldest forests in Europe.